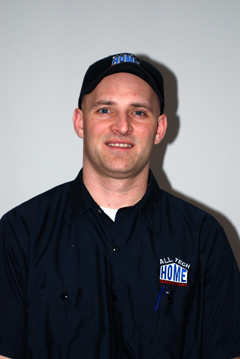 All-Tech Home Inspections is a privately owned and operated company built on strong morals and Professional training. This allows us to provide you with the financial and emotional peace of mind you deserve before, during and after your new home purchase. Michigan is one of the few remaining states that have no licensing laws to regulate the qualifications of Home Inspectors. I personally am shocked that Michigan requires Realtors, physical trainers and even Barbers to be licensed. Yet Michigan allows anyone wanting to call themselves a home inspector act as the authority on the condition of the clients property they are buying or selling. I have an extensive understanding of the building trades with a background as a dealer for Golden Eagle Log Homes based out of Wisconsin Rapids, Wisconsin. Not only have I designed homes and built them, but performed every trade from installing masonry stone fireplaces, stick built and log home framing, roof systems, insulation, plumbing, electrical and hydronic heating systems. I also have 17 years experience in the retail business that has given me the people skills necessary to communicate; before during and after the inspection to provide you with continued service long after the inspection is complete and you have moved into your new home. Being a contractor gave me the knowledge of current building practices, but without my education at Inspector Training Associates, located in Glen Ellen, Ill. I would lack the knowledge and experience of what issues to be aware of in home as old as 100+ years old. - obtain a membership photo I.D. Without these credentials I could not consider myself a Professional Home Inspector. I have been trained by the leading Professionals in the home inspection industry which provides me with the ability to detect structural and foundation defects or damage, existing or potential health hazards such as lead, asbestos, mold, and radon, solid strand aluminum wiring, ultra vent plumbing , poly butylene plumbing, defective electrical panels such as zinsco and bulldog pushmatic, roofing defects, lack of GFCI and AFCI protection, grading deficiencies, unprofessional construction installations or improvements, pest infestations, s-traps, moisture intrusion, many types of defective siding and roofing materials involved in class action law suits; just to name a few defects I see each and every day. Along with the highest degree of training we use professional grade, high tech inspection tools and report writing software. Reports are available within 24 hours of inspection. We also encourage client participation during the inspection and welcome any questions or concerns you might have about the property during the inspection. Our service does not end with the inspection; we are your home consultant as long as you own the property. I perform inspections 7 days a week for your convenience. We also accept credit cards due to the high demand of online payment options. I am passionate about what I do and inspect each and every home as if I were buying the home for my family.